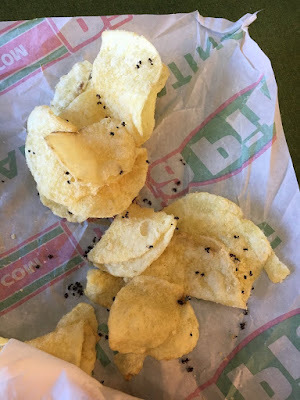 Buzz Kill Ramblings of Tim Louie: NEW POTATO CHIP SEASONING.....ANTS! Before I allow you to continue reading, you might want to finish your breakfast first. Blog posts about food never go down well while eating. Okay, you've been warned, right? So, a high school student in Beaverton, Oregon, (Yes, I said Beaverton! God, I'm such a child!) was really "bugged" out by her lunch this past Tuesday. She said what looked like pepper on her potato chips was actually a bunch of dead ants. I told you to finish your breakfast! Emily Wagoner went to her local Pita Pit (what the hell is that?) and purchased, among other things, a bag of Miss Vickie's salt-and -vinegar-flavored chips. Wagoner said she ate a few chips before she took a close look and almost lost her lunch. She noticed there were ants all over her chips. Ah, it's protein! She tweeted, "I thought it was seasoning." When Wagoner complained to the Pita Pit manager, she was offered a new bag of chips for her trouble, but not a refund on her $14 meal, nor was she given an apology! I am laughing as I write this. People are ridiculous! Needless to say, Wagoner wasn't happy and vowed to never eat at Pita Pit ever again. After a tweet of the bug-infested chips went viral, Wagoner finally heard back from the Pita Pit headquarters. The company sent Wagoner a text saying they were looking into the issue with the location and with Frito-Lay, who makes Miss Vickie's brand of chips. I never heard of those either. The company did offer Wagoner a $50 gift certificate, but she turned it down because she didn't like how she had been treated before. Patrick O'Dell, Pita Pit's marketing director wrote in a statement: "Pita Pit is investigating what led to this isolated incident. Through our communication with the customer it became clear that the initial response to her did not meet our expectations of customer service. We hold our food to the highest quality standards, including pre-packaged items like chips from third-party vendors we partner with, and the health and safety of our guests remains Pita Pit's highest priority." Frito-Lay was nowhere to be found for a comment. This story reminded me of my own incident with ants. I must have been 18 or 19 and hanging out at my "aunt" and uncles house with my cousin in their basement with his friends. My uncle had this fully stocked bar in his basement equipped with actual soda fountains. My cousin and his friends were all drinking and I was just hanging out with them drinking glasses of soda from the soda fountain. Root beer, I believe it was. With every sip I thought I felt bubbles in my mouth as they went down with every sip. I'm not sure what happened, but for some reason I took a look in my glass and it was full of dead ants. Those weren't bubbles from the carbonation I was washing down. Those were dead ants. I almost threw up! My cousin and his friends were drunk, so they started cracking up. We later found out that those nozzles on the soda fountain needed to be cleaned because when they're not, they full of sugar, which attracts ants......Lovely!